Do you need a last minute gift for the Parselmouth in your life? Most of us know Boucheron Trouble as a sweet ambery perfume (officially discontinued, by the way, though still easy enough to find online). Apparently there's also a jewelry collection by this name that is all serpent-themed. 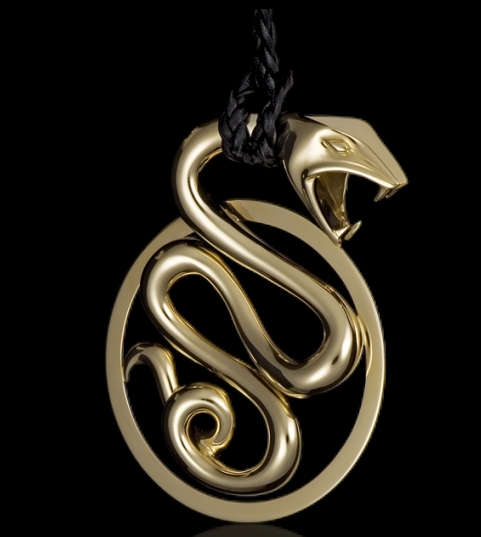 I don't like snakes, but something about the design of Boucheron Trouble Pendant (yellow gold on a braided leather cord, $8100 and it's yours) caught my attention. It really is... interesting. In a somewhat disturbing way. I'd wear it. I love it, but with the price of gold, I'm going to have to do without. A "little" out of my budget, but I think it's gorgeous! I love snakes! I want! Now if only I could scrape together $8100...sheesh, couldn't they make a costume jewelry version of this thing??? I love nonpoisonous snakes (they are one of my totem animals) - great for rodent suppression - and they are so elegant! This is an elegant piece, though I would prefer it without the poisonous fangs.